Our range of products include direct to garment printer. We present state-of-the-art Direct to Garment (DTG) printer to print on T-shirts and Garments from Azon Printer Crotia, Europe. We have different models like Tex Pro and Mirage to cater professional Garment & T-Shirt print requirement. 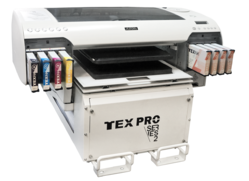 Tex Pro is for single T-Shirt printing while Mirrage is to print two T-Shirts at a time. Looking for DTG Printer ?